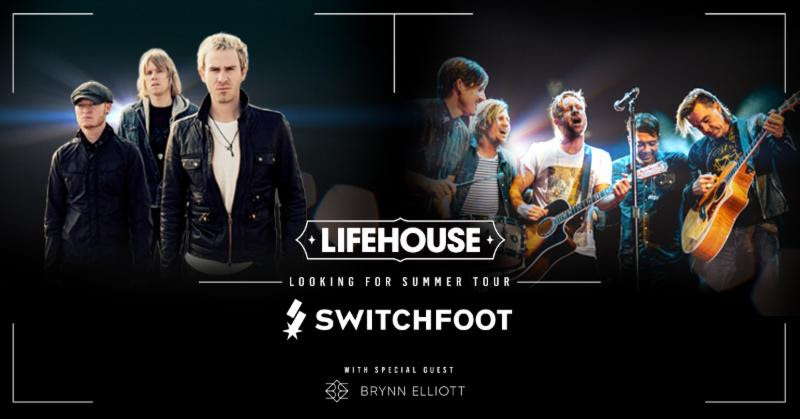 San Diego, CA - April 3, 2017 - Rock fans across North America can look forward to seeing SWITCHFOOT and LIFEHOUSE together for the first time on the "Looking for Summer" Tour, delivering 30+ shows to venues across the U.S. and Canada. The tour kicks off on July 23 at the Fillmore Auditorium in Denver, CO and will run into the fall, culminating at The Masonic in San Francisco on September 10. Up-and-coming songstress Brynn Elliott will open every night of the tour. For additional information and a full list of upcoming dates, please see below or visit: www.LookingForSummerTour.com. On the upcoming tour, the band shares: "We are amped to announce that we are going on tour with LIFEHOUSE for the first time ever. We're calling it the 'Looking for Summer' Tour and we can't wait to sing these songs with you." Formed in San Diego in 1996, SWITCHFOOT is Jon Foreman (vocals, guitar), Tim Foreman (bass), Jerome Fontamillas (keyboard, guitar),Drew Shirley (guitar), and Chad Butler (drums). Since their start, the band has sold over 5.7 million copies worldwide of their first nine studio albums (including their 2003 double-platinum breakthrough The Beautiful Letdown and 2009's Grammy Award-winning Hello Hurricane), racked up a string of Alternative radio hit singles, and performed sold-out world tours with over 4 million concert tickets worldwide.